Pat Jerde received her B.A. from St. Olaf College in 1973. Between 1985-90 she studied at Atelier Le Sueur in Excelsior, where she began teaching in 1990. 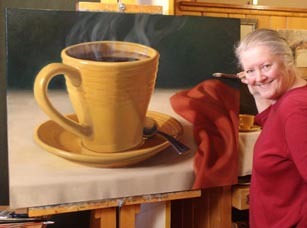 In 1991 Pat and her husband Jeff founded the Minnesota River School of Fine Art in Burnsville. Minnesota. They designed and built a dedicated visual arts facility featuring classrooms, studios, gallery and frameshop in 1994, expanding it to 24,000 sq. ft. in 1996. She served as Director and Head Instructor until the building's sale in 2007. Pat has studied in workshops with artists John Howard Sanden, Richard Whitney, Alexander Gubenov, Joy Thomas, Joe Paquet and Thomas Nash. She has served as a judge for numerous exhibitions and competitions including the Minneapolis Uptown Art Fair, the Minnesota Artists Association, the Minnesota Pastel Society, the Minnesota State Fair and the Lexington Art League in Lexington, Kentucky. I love to paint, and I love to teach! As an artist I have always felt compelled to try to capture the real essence of each person I have drawn or painted. From the age of 4 I felt dissatisfied if I couldn't "feel" the presence of the person I was drawing. And I drew constantly. I tried to find the formal training I wanted in high school and college, but couldn't. Those were the "flaky" years, with an almost ludicrous focus on "being creative" without learning the fundamentals developed over the centuries. I was hugely frustrated, feeling I was born in the wrong era. So I spent many years trying to teach myself, finally thrilled when I found the right school. I think it was the long wait that made me passionate about teaching others the skills I'd finally found. Also, I'd encountered upsetting barriers along the way (gender, age and assumptions by others about my level of commitment). I was determined not to inflict these upon others. The Minnesota River School that we founded and ran for 16 years allowed me to teach hundreds of artists. I did learn the truth shared by other school founders, though -- that I'd not have enough time to do my OWN painting. I now have a studio in the building we built, still with other artists for company, and I divide my time between being a landlord, painting, and teaching.